3 Day HPDE event at Sebring Nov 18-20, anyone going? Friday & Saturday ares instructor school and solo HPDE. Sunday is a regular HPDE with solo and instructed run groups. I am going for all 3 days, not the instructor school part, but just solo driving. Anybody else going? Got back from this event, it went really well and I had a lot of fun. Except for about 30 seconds of sprinkling, the weather was great. The car performed really well, and this was my first event at Sebring with the M030 sport suspension/Koni FSD combination. To me they seemed to be a good match for all of the bumps that Sebring has. Last time at Sebring 8 months ago I was still on the original M030 struts that came with the car. In some sections, like Bishop bend, the car felt really "floaty" and the back end wasn't settled, and the rest of the time the car just kind of flopped around. When I took the springs off the old struts to put on the Koni FSD struts I played around with the old struts, and after compressing the fronts one of them stayed compressed, and the other one came back out in a jerky stuttering fashion. I would definitely say they were shot after 16 years and around 125,000 miles. My previous best lap there was a 2:57.188. This time I ran a 2:50.6 and some 2:51 and 2:52 laps. 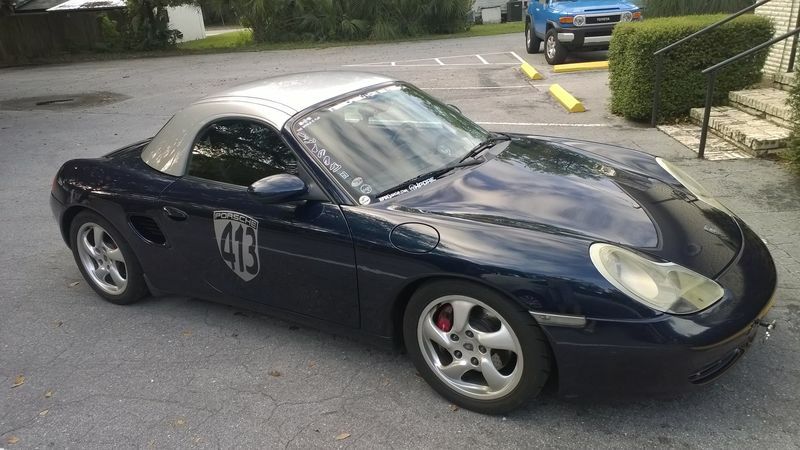 There is still more to be gained as I was totally smoked by a stock 2003 Boxster S on RE71R street tires and Seb (Paseb from this forum) ran in the 2:36 range at Sebring when he had his race Boxster). It was good to see the potential of the car and things to work for next time. This was also my first outing on my newly installed Carbotech XP8/10 brake pads. They are pretty noisy on the street but they brake like crazy on track, I had to move up several of my braking points otherwise I would be way to slow entering some of the corners. There were a few trains going, Sebring has a lot of straights and more powerful cars can pull away for a few seconds and so they apparently think that they do not need to give a point by. Several times after being stuck and slowed down I just let off for several sections so that I could have clean track as I was catching back up. I also need to work on pacing and timing, for example if I am getting held up by a car leading up to a corner, instead of following at a lower speed and losing all my momentum, I should back off a little so I can take the corner at my speed and not lose time all the way down the following straight. We also did some side by side exercises, where we grid up side by side, and run the whole lap on one side of the track beside the other car, and then swap sides on the front straight. That was pretty cool. Several folks in the driver's meeting expressed concern that the track wasn't wide enough for 2 cars at some points... The chief driving instructor said that is exactly the point of this exercise, to show that there is. This first video was after the side by side exercise. Me and my new friend Chris (older White 911 targa) were gridded at the back because we wanted to run side by side together, and we ended up behind two really slow white cars that did not keep up with the rest of the group (desired spacing was 4 car lengths between each pair). When the exercise ended, the whole rest of the field had caught up to us so we let them all by and then tried to keep up. The train in this session was caused by a Red GT3RS of all cars (the side by side session was open to all run groups), and then one of the white cars that was giving trouble over the weekend with no point bys. This next session was probably one of my better sessions of the weekend, I ended behind a 944 that was running a second or slower per lap than me, but he was quicker out of the corners and I could never really catch up enough in the right places to get a pass. I picked up a little speed in 17 trying to keep up with him. This was my best lap of the weekend, the last lap of the day Friday at around 5:25 PM. This last lap happened after I had come in to the pits to get some clean track after being stuck behind an older White 911 RS America that would not give point bys or would drag race to the corner after giving one. I knew there was no way I was ever going to get a point (some of this is on me, I need to work on my pacing as described above) and after dropping back I would just catch back up so I went into the pits. This one is from inside the car and I thought the view with the sun setting was very nice. All in all a good weekend and a good performance by the car and the new Koni FSD. They are definitely softer than a full race suspension or stiffer coilovers, but they seem to be a good match for me and my driving at this time. Last edited by steved0x; 11-22-2016 at 09:27 AM.